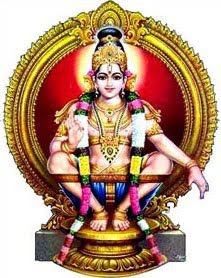 One of the most important mantras chanted by Ayyappa devotees to Sabarimala is Swami Saranam. This mantra is uttered as a greeting when two Ayyappa devotees and pilgrims meet. Everything starts and ends in Swami Saranam. Swami Saranam literally means ‘the only hope is Ayyappa.’ But the two words that reverberates in mind of millions of Ayyappa devotees has a more significant and symbolic meaning. Swa – the uttering of this syllable reminds one of the Parabrahma the ultimate source or the Supreme Being. The syllable ‘MI’ represents Shiva Shakti – creation. Sha – syllable in the mantra represents the destruction of all enemies like ego. Ra – represents knowledge, which purifies and puts us in the path of self realization. Nam – is Shanti and final merging in the Supreme Soul. The uttering of the mantra Swami Saranam installs piety and modesty in a devotee. He suddenly transforms and realizes the Brahman. And he stands before Ayyappa – Prataksya Brahman – the Ultimate Source of creation. Only tears trickle down – realizing Tat Tvam Asi – That Thou Art. In simple terms all animate and inanimate rises and falls in Brahman.